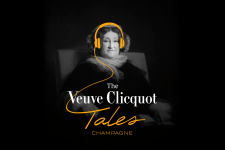 iconic woman behind the name Veuve Clicquot. The episodes feature the most pivotal moments in Madame Clicquot’s life, and the themes of audacity, ambition, family, love, tragedy, travel, determination and discovery that infused them. We discover how this « businesswoman of modern times », courageously took the reins of the House of Clicquot when widowed at the age of 27, at a time when women in France could not even work without their husband’s consent.